Nomad’s door-to-door removal services to Italy are second to none. But if you’re only sending a small consignment of a few boxes or even a single small item, then our dedicated Nomad Parcels website is the ideal solution. Nomad Parcels is our partnership with UPS. This service allows you to access the extensive UPS parcel delivery network, at greatly discounted prices through our account, compared to booking directly. The prices are especially good for larger or slightly heavier boxes. For example, 5 x 25kg boxes from mainland UK to Rome, Italy would cost £99.98 + VAT door to door! Delivery is very fast (3 working days to the northern half of Italy and 4-5 working days to the southern half of the country including Sicily), and the service includes full tracking. You can book and pay directly online at the Nomad Parcels website. Now you can shop online in the UK and have your purchases delivered to anywhere in Italy – even if the retailer or seller doesn’t ship to Italy! Simply have the items sent to us and we will send them to Italy for you, using the cheapest, fastest and most appropriate method for the goods you are sending. You can use this service for eBay sellers who don’t ship outside the UK, small boutiques or even large retailers who don’t offer delivery services to Italy. In this case you just buy from the retailer online and tell them to ship to [Your Name] at [Our Address]. We will receive the items here for you, consolidate them together if you are receiving more than one delivery, and then ship them to Italy for you! If you would like to pack your own boxes of goods (or suitcases etc) to send to Italy, this is no problem! Just tell us the weights and measurements and we will book the shipment for you, and email you the Nomad International–UPS labels. Our partners at UPS will then collect your items and you’ll be able to track the shipments online, all the way to delivery in Italy. If you’re studying in the UK and sending things back to Italy, just box everything up carefully, measure and weigh the boxes, and then send us your order! As long as everything fits into the dimensional requirements (see below: boxes are fine, but mattresses aren’t), this service will be the cheapest way to transport your belongings back to Italy! 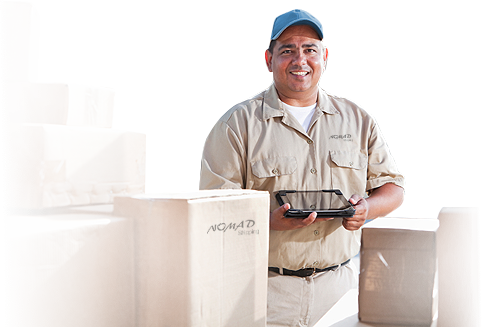 Just contact us by phone or email to tell us the weights and dimensions and place your order, then we’ll take payment and email your Nomad-UPS labels to you. Our UPS partners will arrive promptly to collect the boxes, and you can track them all the way to delivery in Italy. This service is also ideal for small removals, where you are sending boxes but no large pieces of furniture. Nomad International can of course handle removals from anywhere in the UK to anywhere in Italy, doing the whole job ourselves with our own team and vehicles – but for only a few boxes, it is very expensive for us to send a removal truck and removal team of course. But now through our partnership with UPS, it is easy, fast and very cost-effective to send only a few boxes, suitcases, TVs etc all the way from your home in the UK to your home in Italy. In many cases this is actually the cheapest way to move boxes, suitcases etc from the UK to Italy. If you are in Italy buying from a UK eBay seller, or if you are in the UK selling on eBay to a customer in Italy, we can arrange the shipping for you! Just have the package/s sent to our warehouse in Peterborough (or we can even arrange collection) and we will send the items to Italy for you, with tracking the whole way. Just give us a call or send us an email to get a quote and book this service. Please remember that unlike our normal removal services, where we are the only company handling your goods, this Nomad-UPS parcel service involves another company (UPS) handling your goods. Therefore it is even more important than usual that everything is packed very well. Please see our videos on export packing for advice on how to pack fragile items into boxes (scroll down to the first 3 videos). Always use strong cardboard boxes (not plastic boxes), and make sure the cartons are completely filled (using packing materials to fill any gaps). 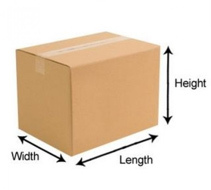 As a general rule use at least 2 inches of packing material between the contents and the outer box, as well as packing in between the contents. If in doubt, use more packaging material rather than less. Finally, seal all the edges of the box using tape. UPS also has some detailed advice on packing here. If you are bringing the items to our warehouse (or if you are ordering online from a retailer and having the goods delivered to us), and you need us to professionally pack the items for you, we can do this too! As a removal company we are specialists in packing and protecting delicate items, and we have expert staff on hand to wrap and pack things for you. Just bring them into our Peterborough warehouse and we will wrap and pack everything for you for a small fee prior to shipment. Items purchased directly from the retailer are usually packed suitably for international transport, but occasionally this is not the case and the items will need additional packing, so we will discuss this with you and provide additional protection in these cases. Insurance is available at 2.0% of the value of the goods you are sending, plus IPT (this works out at 2.24% of the value of the goods including all taxes), with a minimum charge of £11.20. These prices are door-to-door, with full tracking. For customers who are buying goods online there are some additional options with standard costs. Packing is not normally required, but if it is this is charged at £2.00 + VAT per cubic foot with a minimum charge of £4.00 + VAT, which includes the packing materials. If wooden crates are required (in the rare case of antique furniture etc), this cost is additional. Storage is free of charge for up to two weeks. Additional storage can be arranged on request – we can store any volume of goods for any length of time in our secure Peterborough warehouse.